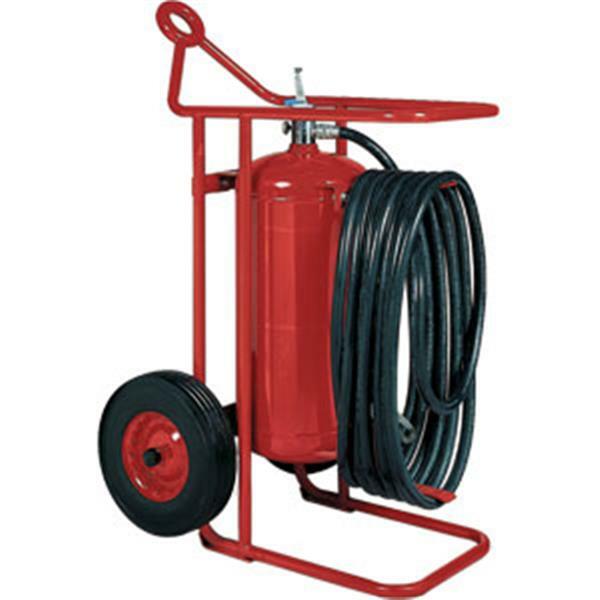 View cart “Badger Wheeled Fire Extinguisher Stored Pressure 125-Pound ABC-Class Extinguisher, 50′ Hose” has been added to your cart. 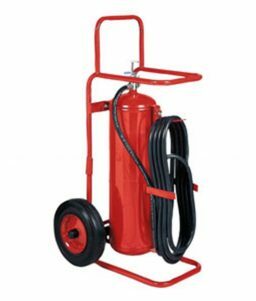 The Badger 150MB 125 lb Wheeled Fire Extinguisher is a midsize model engineered for durability and dependability by Badger Fire Protection, a recognized leader in manufacturing products for fire safety. This model uses ABC Dry Chemical fire extinguishing agent for Class A, Class B and Class C fires and comes with semi pneumatic rubber tires. 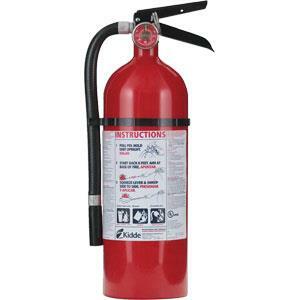 SKU: LS - 20653B Categories: Fire Extinguishers, Wheeled Fire Extinguishers, ABC Dry Chemical Wheeled Fire Extinguishers, 125 lbs Wheeled Fire Extinguishers Brands: Badger Fire Protection. Badger Fire Protection is an ISO-registered company and trusted leader in the manufacturing of industrial and commercial grade fire extinguishers for more than 100 years. 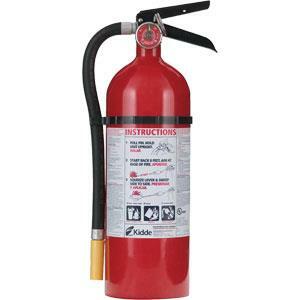 Known for their quality products and economical pricing, Badger fire extinguishers are recognized for containing the highest percentage of essential base ingredients found in the fire safety industry. 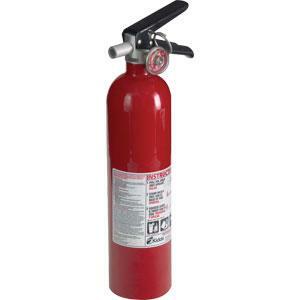 Badger Wheeled Fire Extinguishers are rechargeable, meet relevant regulatory requirements and are USCG approved and listed by the National Fire Protection Association, Underwriters Laboratories (U.S. and Canada), the Occupational Safety and Health Administration and the United States Coast Guard. This 150MB model is constructed with a solid, well-balanced frame, equipped with steel cylinders, brass valves, and semi pneumonic tires to provide product dependability, durability and functionality in protecting commercial and industrial property from many forms of high-risk fire hazards. Designed for one-man operation this unit is easily transportable through doorways and down aisles and can maneuver effectively over rough terrain. With a 125 lb. 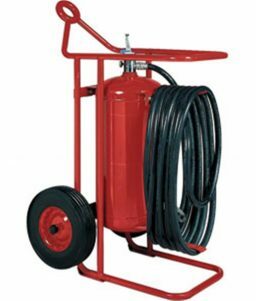 agent capacity this model has sufficient fire extinguishing capacity to cover 240 square feet of fire, discharging with a spray duration of 45 seconds at an average agent flow rate of 2.6 lbs/per sec, for a range of 30-40 ft. 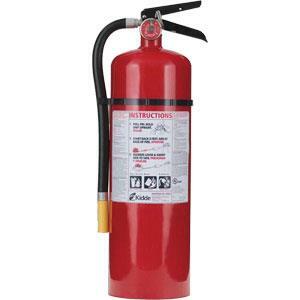 This dry chemical fire extinguisher is a great choice for offshore rigs, ship docks, chemical plants, aircraft ramps, refineries, remote construction sites, large laboratories, processing plants, storage, docking, and loading areas. 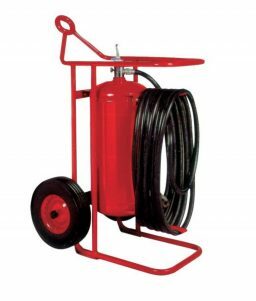 Additional Reading: “Wheeled Fire Extinguishers – Specifications“.